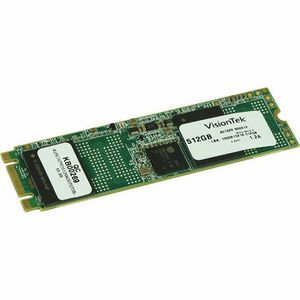 The VisionTek SSD 512GB M.2 2280 SATA NGFF is designed to bring ultra fast, reliable storage to mobile PC users. With the shift from the hard disk drive to the solid state drive the VisionTek SSD 512GB M.2 2280 SATA NGFF is a drop-in replacement for the hard disk drive (HDD) or conventional Solid State Drive (SSD). It delivers superior reliability, durability, performance and power efficiency - keeping mobile PCs working reliably in the toughest of conditions. Conforming to the industry standard M.2 2280-D5-B-M specification, the SSD integrates easily in existing storage infrastructures. The VisionTek SSD 512GB M.2 2280 SATA NGFF provides high bandwidth and IOPS while efficiently managing write amplification. Employing SSD technology in a system enables faster boot times, quicker application load times, lower power consumption, and enhanced reliability.